Numerous high-income countries are currently aiming for a socio-technical transformation toward carbon-neutrality and more sustainable energy resources. Developing countries, in contrast, seem to be rather locked in conventional fossil energy systems in order to fulfill basic societal functions: Access to reliable and affordable electricity. The study by Zaman et al. (2018) highlights this dilemmatic, unsustainable transition happening in the energy landscape of Bangladesh. Bangladesh is one of the countries that prefers the development of large-scale coal power generation in the coming decades. Bangladesh, in the one hand, is one of the Asian frontier economies following an incremental economic growth rate in the recent past; it is also endowed with a large population (163 million) having low per capita income (~ US$1,360 per year). On the other hand, it is facing acute energy challenges, including dwindling local gas reserves, unexplored coal deposits due to difficult geological and hydrological settings, and a perennial supply-demand mismatch; the current grid electrification rate is as low as 66%. In the recent decades, Bangladesh was strongly dependent on natural gas to serve national electrification purposes, as can be seen in Figure 1. Figure 1. 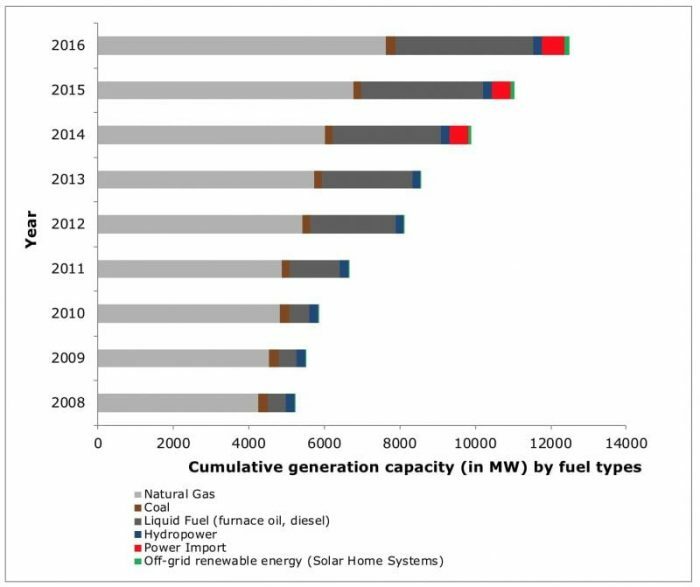 Installed (on-grid and off-grid) generation capacity by fuel type in Bangladesh power generation during 2008-2016. The recent national energy policies emphasize the implementation of large-scale coal fleets. It is estimated that coal contributes at least 35 % of the total electricity generation mix. On the one hand, such a large coal fleet will allow for cost-effective electricity generation and mitigate the prevalent energy security issues. On the other hand, this unsustainable transition sidelines not only the severity of climate change vulnerabilities Bangladesh tends to experience due to its geographical location, but also the associated long-term negative externalities that come with coal power generation. This study, therefore, attempted to identify and assess predominating challenges and constraining factors influencing coal-based power generation in the context of Bangladesh. In a first phase, relevant context-specific factors were identified and validated by energy experts. A multi-criteria decision analysis method then was applied in a second phase to assess the relative importance of the identified factors. Table 1 represents the factors influencing coal power in Bangladesh along with their overall ranking. Table 1: Priority ranking of factors in coal-based power generation in the context of Bangladesh. The results reveal that factors related to socioeconomics, coal sourcing, and the environment are particularly significant. 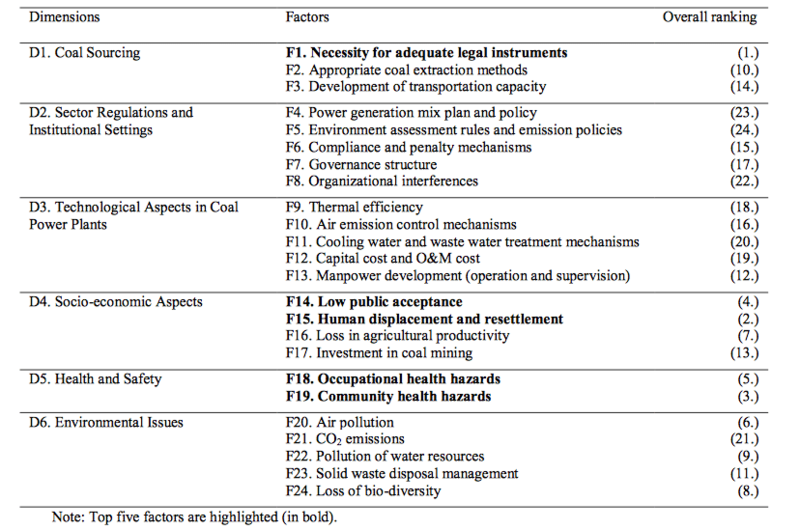 Lack of adequate legal instruments (F1), potential displacement and resettlement of affected populations in the coal mining areas (F15), low level of social acceptance (F14), related public health issues (F18, F19), and local environmental concerns (F20, F22, F24) seem to challenge the large-scale implementation of coal power in the coming decades. Interestingly, potential carbon emissions (F21) from coal power plants receive very low priority in the assessments undertaken by energy experts. With its low emission figure (0.39% of world’s total), it is argued that Bangladesh has the right to use coal as a cost-effective energy resource to accelerate macroeconomic development. Besides, factors related to technologies and regulatory settings (e.g., F4, F5, F12) also are considered unimportant; international cooperation on technology transfer and skills development, and continuous policy reforms could be possible explanations for such low rankings. and a comprehensive discourse and systematic review of environmental regulations, policies, and technological compliance issues. However, negative externalities seem imminent with such a large-scale implementation of coal power in the coming decades. One prime concern is the path-dependency of the electricity system. Once the coal fleets have been installed, it will not be easy to phase them out again due to infrastructure investments, technology lock-ins, and established routines, rules, and practices. Moreover, implementing coal power is highly unsustainable not only with regards to CO2 emissions but also in terms of increased dependence on coal imports. 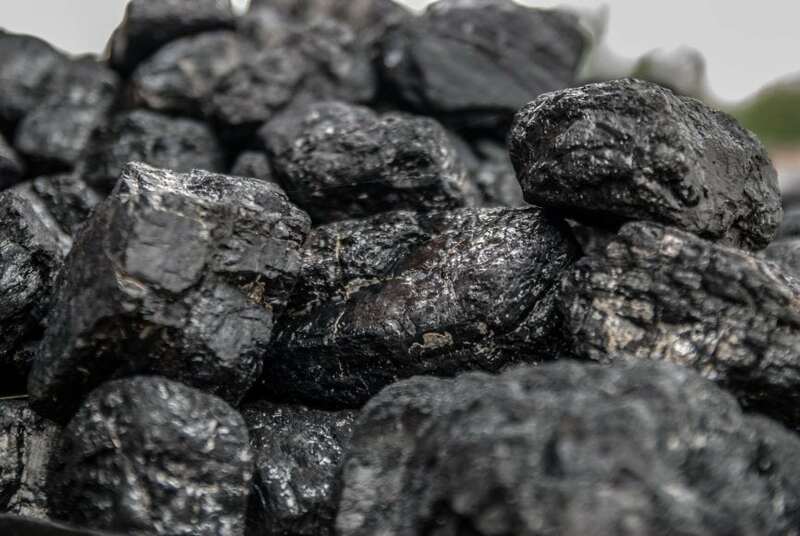 To conclude, the use of coal as an energy source might not be entirely unavoidable in Bangladesh yet; however, the issues related to the massive-scale extension of coal power call for careful and critical evaluations of the pro-coal strategies. Systematic policy learning, as well as strict regulatory enforcement, will be necessary not only to address national energy security but also to cope with Bangladesh’s vulnerability to climate change and mitigation efforts. These findings are described in the article entitled A multi-criteria analysis of coal-based power generation in Bangladesh, recently published in the journal Energy Policy. This work was conducted by Rafia Zaman from Khulna University, Thomas Brudermann from the University of Graz, and S. Kumar and Nazrul Islam from the Asian Institute of Technology. Previous Post« Previous Circular Economy: Can Pollution Be Turned Into Resources?